Thinking about joining the dark side. Thread: Thinking about joining the dark side. I still love my 86, but just bored with it, so its been in hibernation for a while. 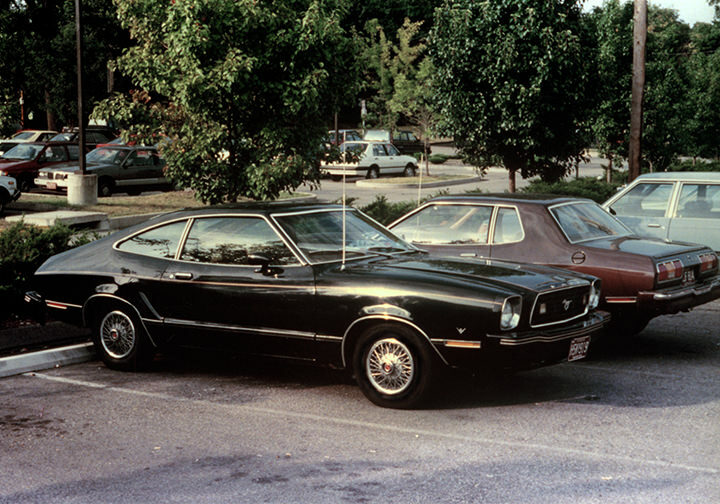 This weekend, I am going to go look at a 78 Mach 1, no motor or trans, was a 302 auto. So, I am thinking about something different. Back in the day, Mustang ll's where everywhere, now you hardly ever see them. But today? They are few and far between. Does anyone know of a forum that is mustang ll, that is still up and running? The only worthwhile Mustang II is powered by a 460. It's only the dark side if you put a Honda motor in it. I think those cars are cool, though as cars they are reflective of pretty much everything else that was made in the mid to late 1970s, which isn't a compliment. But you could get one with a 302 in it, so you can use stuff that you're familiar with from your Fox Mustang. These cars were the precursor to them, actually, so they had a lot to do with keeping the fires burning, even slowly, while American car makers finally settled down to the task of figuring out how to make good cars that were fun to drive and didn't look like a leisure suit mated with a dump truck. These look decent, especially when you compare them to the other cars on the market at the time. Have at it! My wife recently picked up a 74 Mustang II coupe. Much of the activity is on Facebook pages. Getting some of the parts seems tough. There is some repo stuff and a little NOS stuff out there. Get a complete car of what you plan on using. Most of the cars I have seen locally for sale have been pretty rough and going for $3-6k here in CA. Not a lot to pick from either. I can only imagine the rusted out hulls in other parts of the country getting the same money. For $3k, we drove this one home. You will be forced to live a Rodney Dangerfield life. No respect. Especially from newer mustang owners "those thing are junk". Just remind them that if it wasn't for the II's that they probably would not have the mustang they drive. There are several interior sections or parts very similar in design to fox chassis cars. Almost as if carried over with minor changes. Sport steering wheel for one. "Cobra takes the curves like a snake." I always liked them. But I thought the 72/3 got to big. i had a very nice 84 fox and got this 76 Cobra II around a year ago. I decided to keep only one so sold the fox. I love the II and plan to never sell. It has a 9 inch rear with 3.50 gears, 5 lugs, built 302, edelbrock heads, and runs very strong. It gets a ton of looks when I take it out. some call it a pinto until they really look at it or hear it. was restored and painted 30 years ago. Well, She will becoming home soon. Its a 78 mach 1, originally 302 with an auto. Needs a windshield, rust repair around the gas cap, generally straight, its in primer. It was originally white, with black lowers. standard red interior, no spoilers, no console,but it does have air, oh, and no gas tank. Current plans include a fresh 5.0 aod from an 84, subframe connectors, fuel cell and an 8 point roll bar.looking for low 12's. If Ford hadn't work up and built the foxbody ....... I wouldn't own a Mustang. Back when i bought mine I couldn't afford a 60's car and I wouldn't own most of the stuff that came after until the four-eyed fox cam around. But I won't bash on them too much. To each their own. Drop a manly mountain motor in that grown up Pinto and send it. All Girls Garage has done a couple episodes with one. Kevin, that's sweet. Especially since I like base model low option cars. If memory serves, cars which were "special paint" were equipped with silver bumpers. Have you had a chance to do any research on the car? Kevin and I are involved with MCA shows. There are two or three folks who regularly bring their restored or lightly modified II's to the shows. It is always great to see these cars. I'm friends with one of the owners, he says they are definite "labors of love." He sources many of the parts from junk yards, plus "the guys who know where the parts are and/or have stashes themselves." It is always interesting to consider a $400K Boss 429 on the same show field as a humble restored II then all the way back to today's ultra performance Shelbys.